Bissell Powerfresh Lift Off Pet Steam Mop instead. Welcome to the Best Bissel Steam Mop reviews. We offer consumer reviews of the 3 most popular steam mops. We will help you decide whether a Bissell Mop is right for you and your home. The Bissell mops are highly rated and have consistently received rave reviews from customers. These efficient machines clean by using only water to create steam which are capable of disinfecting your floors and hard surfaces. Bissell steam mops are great for use in homes, especially when family members suffer from allergies. The reason for this is because the steam is capable of killing allergens and other germs leaving your home fresh and clean. You will never have to use chemicals again. There are many models available from which you can choose. Most of the models clean hard floors, however some are capable of cleaning carpets. 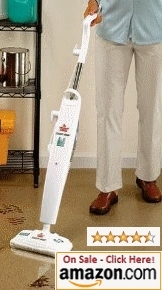 This is an upright steam mop that uses only steam to clean. It has a 360 degree swivel mop which allows you to easily clean around corners. It is one of the most highly recommended steam mops and can be bought for around $70. For each fill on the water tank you can get 15 minutes of cleaning. Steam cleaning is particularly effective on cleaning those sticky floors and surfaces in your kitchen and home. In order to properly disinfect one such area, allow the steam mop to sit on the area for 15 seconds. Overall, this mop weighs a mere 7 lbs and is covered by a one year warranty. So what are consumers saying about this mop? 1. It is very quiet when compared to other steam cleaners and the clean up is very simple. 1. Many consumers wished that the cord was a bit longer. This can be remedied by using an extension cord. 2. Some found that the microfiber pads could have been thicker and wore out too quickly. 3. Some found that it left the floors too wet. This is debatable as some consumers report that it steams well and the floors dry quickly. This is the deluxe version of the steam mop which also comes with a carpet glide attachment which allows you to steam clean your carpets as well as your floors. It heats up in 30 seconds and steams for about 15 minutes before it needs to be refilled. Like the 1867-7 model it also has a 360 degree swivel mop head which helps you to clean around corners. It comes with a water purification system which cleans the water of impurities and minerals. This ensures that there is no build up in your machine which makes it last longer. 4. Reduces your cleaning time. 3. Some consumers report leakage problems. This steam mop is highly rated and has earned a 4.5 star rating. It’s a bit more expensive than the last two models at $92. This mop sports many of the same features as the other two mops so we shall dive into the consumer reviews to get a closer look at this steamer. 6. Many consumers report that they prefer this mop over their Swiffers. 3. Some consumers thought it was a great product but there was too much “hype” around it … It’s a steam mop, not a miracle worker.